Mercury is getting a lot of attention, both in the popular press and in state and federal regulatory agencies. Combustion systems, like coal-fired power plants, industrial boilers, incinerators, and cement kilns, are sources of mercury emissions to the air. This article outlines the mercury emission regulations that apply to different combustion systems and the best demonstrated means to control these emissions from combustion sources. This article focuses on utility and industrial combustion systems because they are the highest emitters and face the greatest reductions and tightest scrutiny. The primary exposure route to mercury for humans through eating fish. Mercury concentrations in the air are very low and don’t represent a direct health threat, but mercury in the air deposits on land and water, finding its way to lakes and rivers, where bacterial action transforms it into a highly toxic form (methyl mercury), which builds up in fish. The annual global mercury emissions from all sources, natural and anthropogenic (human-caused), total roughly 6,600 to 7,200 short tons (non-metric tons) per year. The United States contributes an estimated 5 percent of the global human-caused mercury emissions (or about 167 short tons). Figure 1 shows the contributions from various industrial sectors in the United States to air emissions of mercury. The U.S. Environmental Protection Agency (EPA) currently limits emissions of mercury from certain categories of combustion sources on an annual basis, as outlined in Table 1. EPA uses a Maximum Achievable Control Technology (MACT) standard under the Clean Air Act to specify control technologies for mercury emissions from most combustion sources, with the exception of coal-fired power plants. For incinerators and municipal waste combustors, the MACT standard is based on input feed rates to the combustor. The MACT standard for coal-fired industrial boilers specifies mercury emissions verification either by control of mercury in the fuel or by periodic stack testing. 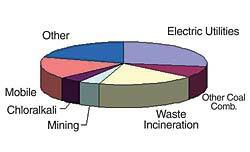 Most combustion sources in the United States are subject to limits on mercury emissions from the stack. How does mercury get into the stack and how can these emissions be controlled? Incinerators burn a variety of materials, many of which contain mercury. Common household items like batteries, lamps and pharmaceuticals may contain mercury. Hazardous waste incinerators can process common industrial wastes, like residues from industrial or commercial painting operations, metal-cleaning fluids and lubricants, electronic industry solvents, or solvents from automotive aftermarket operations Combustion boilers that burn coal make up a significant portion of industrial mercury emissions. The mercury content of coal is low, on the order of 100 parts per billion by weight, but electric utilities and industrial users burned about one billion short tons of coal in 2005, according to the U.S. Department of Energy. When coal or other fuel is burned in a boiler at combustion temperatures well above 2,000 degrees Fahrenheit, all of the mercury vaporizes as its gaseous elemental form. In coal combustion systems, mercury can be present in the flue gas in concentrations between 0.5 and 5 parts per billion by volume (4 and 45 ?g/dsm3). Concentrations of mercury in the flue gas can be much higher in municipal and hazardous waste combustors. From the combustion zone to the stack, chemical transformations of mercury take place. A large fraction of the gaseous elemental mercury can be oxidized by halogens like hydrogen chloride (HCl) to gaseous oxidized mercury (or Hg2+). Furthermore, the gaseous mercury can be adsorbed on ash particles, particularly those that are high in carbon (from unburned coal). The air pollution control equipment in use at boilers and incinerators can remove gaseous oxidized mercury and mercury bound to ash particles. The elemental form of mercury is relatively insoluble in water and thus is difficult to capture in air pollution control devices, since it has a high vapor pressure and is not soluble in scrubbing solutions. 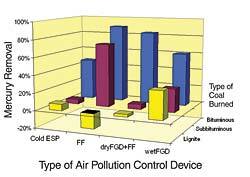 Particulate control devices, like fabric filters (FFs) and electrostatic precipitators (ESPs), collect any mercury that is adsorbed on the ash particles. Flue gas desulphurization (FGD) units remove about 90 percent of the gaseous oxidized mercury, but almost none of the elemental mercury in the flue gas. In fact, some wet FGD systems actually emit more elemental mercury than enters, because of chemical reactions that take place in the scrubbing solution. Figure 2 shows average mercury removal on coal-fired electric utility boilers with different air pollution control devices. This information was collected by EPA in 1999 on a small subset of U.S. power plants. In Figure 2, the mercury removals across cold-side ESPs, FFs, wet FGDs (with ESPs), and dry FGDs (with FFs) are divided up by the type of coal that was being burned. The mercury removal rates shown in Figure 2 have been sorted by type of coal because there are several aspects of coal type that affect the formation of oxidized mercury and particulate mercury. Bituminous coals in the United States contain much more chlorine than subbituminous coals or lignites. Chlorine is the principal halogen in coal that oxidizes mercury. The amount of unburned carbon in the ash tends to be higher in bituminous-fired boilers, and unburned carbon in ash has been shown to be effective both at catalyzing the oxidation of mercury and in adsorbing gaseous mercury. Thus, in bituminous-fired boilers, high levels of mercury removal are already occurring with the existing equipment for removing sulfur dioxide (SO2) and particulate matter. In boilers that fire other types of coal, much less mercury removal can be expected. Incinerators that burn chlorine-containing waste can also remove mercury efficiently using the combination of a scrubber for SO2 and a particulate control device. However, combustors that burn subbituminous or lignite coals do not currently remove much of the incoming mercury. In order to comply with state and federal regulations, some combustion sources, particularly in the utility sector, might have to apply additional mercury control processes. Various agencies including EPA, the Department of Energy’s National Energy Technology Laboratory (NETL), the Electric Power Research Institute (EPRI), some academic institutions, and numerous private companies have invested in a wide range of mercury control research for coal-fired utility boilers. There are many technologies currently under development, but injection of powdered activated carbon is the most mature and cost-effective mercury control technology for the power generation sector, if additional removal is required over and above the “native” capture that occurs in scrubbers and particulate control devices. Injection of activated carbon (AC) has been used to control mercury and dioxin emissions on municipal waste combustors for many years in the U.S. Until recently, this control technology hasn’t been used on a large scale for coal-fired boilers. Activated carbon has proved effective for mercury control on incinerators because of the relatively high uncontrolled concentrations of mercury in incinerators and the preponderance of oxidized mercury, owing to the high chlorine in incinerator feed. Activated carbon injection has not always been as successful at coal-fired boilers because uncontrolled mercury concentrations can be 10 or 50 times lower in a coal-fired boiler than in an incinerator and because coal often has considerably less chlorine in the feed system than many waste streams. 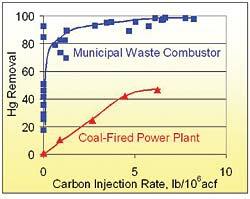 Figure 3 illustrates the difficulties in applying activated carbon to a coal-fired power plant, as compared to a municipal waste combustor. Both the power plant and the municipal waste combustor had the same air pollution control equipment -- a dry scrubber followed by and ESP -- and a similar activated carbon, manufactured by Norit Americas, was injected upstream of the dry scrubber in both. A wide range of mercury removal has been observed from many different coal-fired power plants with injection of AC during short-term field tests, as can be seen in Figure 4. 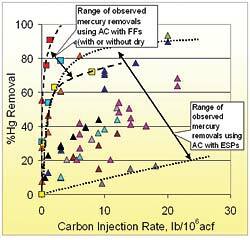 Injection of AC upstream of FFs (with and without dry FGDs) has shown consistently higher removal of mercury than injection upstream of cold-side ESPs, because of the greater contact between sorbent and flue gas in FFs. The data in Figure 4 show a wide range of mercury removal rates. This is because a great many factors impact the effectiveness of AC injection, including flue gas temperature, concentration of sulfur trioxide (SO3) in the flue gas, concentration of HCl and other halogen species in the flue gas, and the contact between the AC and the flue gas. The unique combination of these factors in each combustion system suggests that a specific technology should not be expected to provide the same reduction for all combustors. The ongoing research and development work on AC focuses on overcoming the limitations imposed by these factors. Combustion sources emit a significant amount of mercury to the air. In the United States, emissions of mercury will be regulated by 2010 for all major stationary combustion source categories, principally coal-fired boilers and incinerators. There will be a growing need in the United States to monitor mercury inputs and emissions, and, in some cases, to control mercury emissions. For some types of combustion sources, mercury control technology can already achieve high rates of removal. However, further research and development is under way to improve mercury removal rates for certain combinations of fuels and existing air pollution control equipment. The electric utility industry is also facing a proposed set of regulations from EPA that would limit mercury (Hg) emissions. The Clean Air Mercury Rule (CAMR) was promulgated March 15, 2005, and the first phase will take effect Jan. 1, 2010. CAMR sets limits on how much total Hg can be emitted by each state. On a national basis, these limits correspond to 38 tons per year from 2010 to 2017 and 15 tons per year in 2018 and beyond. There will be a national cap-and-trade program so that utilities can buy and sell Hg emission credits. Continuous monitoring of Hg concentrations in the stack will be required for electric utility boilers starting January 1, 2009. Each state can choose to adhere to CAMR or the state can devise separate Hg regulations. About half of the states plan to participate in the national cap-and-trade program under the CAMR legislation. Some other states will adhere to the CAMR state emission limits, but will not allow trading. About one-third of the states will not participate in the CAMR program, but have set more restrictive Hg emissions for the power plants in those states. In many of the states that have proposed more restrictive Hg emission limits than CAMR, Hg removals of up to 90 percent (based on the fuel inputs) will be required.